Share the post "1042 – 1st St. NE"
That was quite the turn-about with the weather last night. We couldn’t have had a better example of radical temperature changes. I just now remembered something I read a number of years ago regarding weather statistics. At the time, Mason City ranked in the top ten in the Nation per capita as being a city with the greatest temperature differences over a year’s time. Yesterday’s near 50 degree temperature change in less than 12 hours was another confirmation, but at least we didn’t get the hail some had predicted. I’ve been around enough people in my life who’ve contributed nearly nothing towards the betterment of others, but have always been quick to find the smallest of fault and then blow them far out of proportion. Someone just mentioned yesterday how people like that are prime examples of self-reflective behavior. It’s almost as though they want you to be pulled into the mirror they themselves are looking into. Have you ever noticed how at times when you freely give someone something, they somehow find the most minuscule fault with it? Well, that’s their way of pulling you back into their mirrors. They’d never give you anything of value for free, so whatever you give is considered inferior no matter how good it really is. Early this afternoon I listed a sizzling hot deal of a newer ranch home that’s priced to sell NOW! 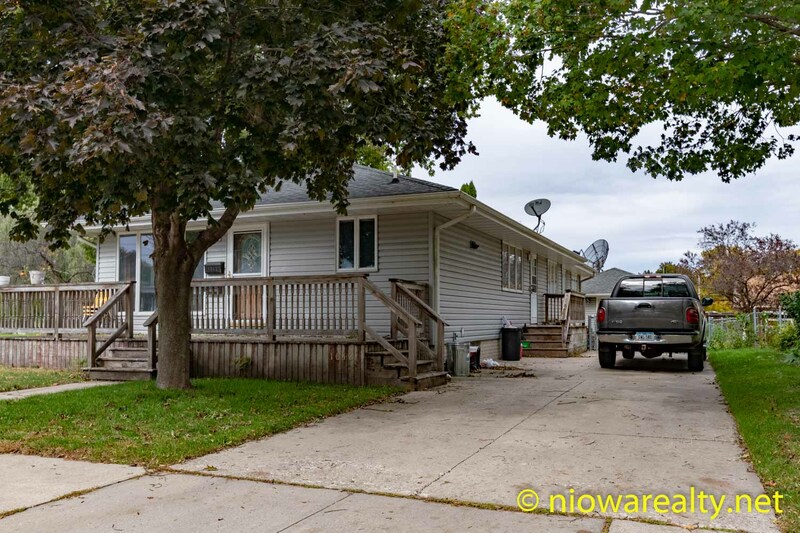 It’s located at 1042 – 1st St NE here in Mason City which is only about a block from East Park, and priced at a whopping low price of $119,500. It was custom built in 1985 by the original owners, and for sure their extra effort shows. It’s only a 2 bedroom, but it has over 1,500 square feet on the main floor which is highly unusual. The basement is fully finished with a half bath which I believe is already plumbed for a shower, a family room, and two extra rooms that could easily be converted to bedrooms if someone would install egress windows. I have to classify the garage as a 1 stall because it has only a single overhead, but if you’d make the opening bigger and hang a double door, there’d be room for two cars. Believe me, there’s not one home in its price range that’ll compare with it! It’s assessed value is over $147,000, and I was told by the previous owner that they didn’t get a drop of water in its basement during the flood of 2008. Now that’s saying something. Yes, it need some cosmetics, but what a great buy! Even if you’d put just a little lipstick on it, it would likely sell for upwards of 20K more. I’m planning a public open house on it this weekend, and hopefully have it under contract before Monday arrives. My late afternoon appointment took me to 105 W. North in Manly this afternoon. It’s another diamond in the rough that’s going to be a money maker for the right buyer. We have it down to $23,500 and looking for offers. If I were young, I’d jump on that house and make it my winter project. Working on smaller homes is more enjoyable because you can see progress being made all the faster. While seeing so many good project homes on the market, I’ve decided our society is growing all the lazier, and it’s mostly due to the addiction to the internet and smart phones. If only many of our young would realize that once their youth is gone, there’s no going back to play catch up on time wasted. Now don’t forget about 1042 – 1st NE because there’s no question it’s a fabulous opportunity to create instant equity. The above photo is the street shot. Tonight’s one-liner is: The road to success isn’t easy to navigate, but with hard work, drive, passion, and above all, vision, it’s possible to achieve the American dream.